On the plane back to Beijing, I read a great Economist special report on cars in emerging markets. It’s about time I wrote something about autos in China, so I will focus on the important China conclusions from the report. As with almost every meaningful absolute development statistic, it’s not a question of if China will pass the US, but when. In the case of total passenger-vehicle sales, China is predicted to pass the US for good in 2010. But relative development statistics usually tell a different story. China only has 30 cars for every 1,000 people of driving age, versus more than 900 cars for every 1,000 people in America. But China’s market is growing rapidly, while America’s is stagnating or even reversing. Just over 70% of cars sold in China are foreign made, with VW and GM leading the charts. Interestingly, the article notes that in the early days of the Chinese auto industry, VW, the first to set up a Chinese JV with Shanghai Automotive Industry Association, accounted for 56% of the domestic market! This helps explains the remaining dominance of VW in some markets, like the Shanghai taxi market. Will Chinese brands take more of the market? It’s an interesting question. Chinese still look down on their native brands, often with good cause… Chinese consumers are brand snobs who increasingly expect to be able to buy the best. Yet with its gigantic home market and a supportive government, it would be surprising if in ten years’ time China did not have at least a couple of car firms competing on equal terms with the world’s giants. I truly hope that’s the case, and my Chinese manufacturer of choice is BYD, who I will describe in a moment. As with most environment and development issues, you can either see China as the problem or as the solution. Without a doubt, rising car use in China will be an environmental problem in the short term. Increased local pollution from tailpipes as well as carbon emissions will damage the environment. Moreover, the Chinese market looks to be copying the US’s bad example of large-car growth: in 2007, luxury car sales grew by 35% and SUV sales grew by 50%, versus just 4% sales growth for small cars. A new “green” tax may help to incentivize growth in smaller cars and will also help domestic automakers. This is a tiered tax related to engine size that puts the lowest tax rate (1%) on cars with engines smaller than 1 liter, a market dominated by Chinese automakers. The tax increases progressively to the highest tax rate (41%) on engines larger than 4.1 liters, a market dominated by foreign automakers. A clever use of green protectionism, and also good public policy. But while the tax will help, it probably won’t make much of a dent in the massive growth of the Chinese auto market. And even still, auto growth outside of China will be massive. According to the IMF, the world will have 2.9 billion cars in 2050, up from 600 million now. How will the environment cope with 3 billion cars on the road? The only hope is to decouple the growth in autos from growth in CO2 emissions from autos. China is already starting to take up the challenge. Chinese electronics firm BYD is rolling out a fully electric car with incredibly promising battery technology. The first models will hit the street in Israel in 2009. A firm controlled by Warren Buffett’s Berkshire Hathaway took a 10% stake in BYD in October (See Green Leap Forward’s blog post on it for a closer look at BYD and Buffett’s investment). I really think/ hope that BYD’s technology platform will it allow to roll out cheap, reliable, comfortable and marketable electric cars in short order. I also think they’re right to start by selling their cars first in foreign markets. This way, if all goes well, BYD can bring the product back to China as a successful developed world concept, which will help combat the traditional mainland China consumer bias against domestic auto brands. I think BYD also represents a new model for China and it's industrial policy. BYD is essentially leapfrogging the old guard of internal combustion engines, and moving straight to the future. i personally think China's push into auto manufacturing is misguided, since gasoline powered autos make no sense in the carbon neutral world that we're ultimately going to have to get to. I think biofuels could be a useful intermediary step, but doubt they will make it in the long run. China can also use its relative lack of installed petrol infrastructure as an advantage, and leap frog to an electric grid. (For more on how this might be done, read about betterplace, a company with a business plan for replacing that really wowed me.) But in order to get over the CO2 emissions problem, the car fleet must be powered by renewables. While I really think that China’s leadership can help the world cope with the environmental strain of 3 billon autos, I don’t know why we would want to. Even after we solve the environmental piece of the problem, we will still have the problems of both traffic and social isolation that go hand and hand with car-centric development. I’ll leave the readers with the below photograph from TreeHugger. 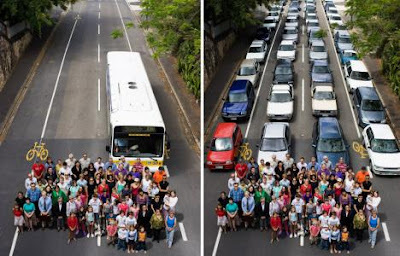 In 2050, in a world with 9 billion people, how can we find space for 3 billion cars on the road?